VATICAN CITY (CNS) — Acknowledging and sharing God’s mercy is a permanent part of the Christian life, so initiatives undertaken during the special Year of Mercy must continue, Pope Francis said. In the Gospel story, the pope wrote, and in the sacraments of the church, particularly confession and the anointing of the sick, “references to mercy, far from being merely exhortative, are highly performative, which is to say that as we invoke mercy with faith, it is granted to us, and as we confess it to be vital and real, it transforms us,” as it did with the woman caught in adultery. 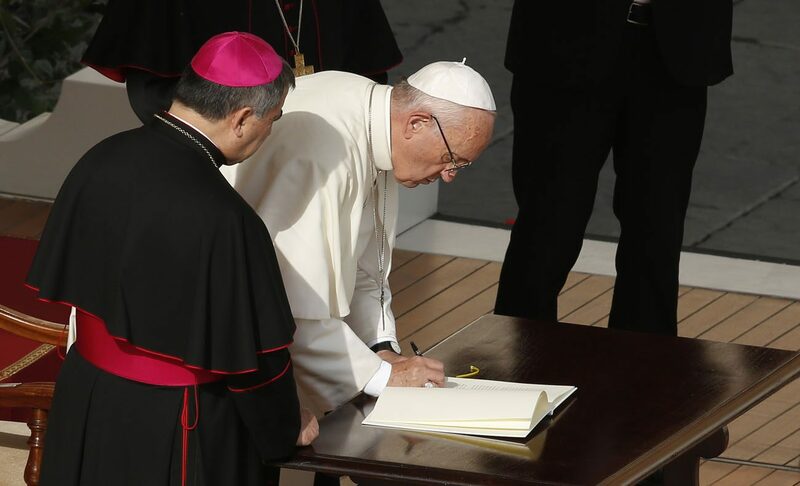 “This is a fundamental element of our faith,” Pope Francis wrote. In celebrating and welcoming God’s love and mercy, he said, a special place in the church must be given to families, especially at a time when the very meaning of family is in crisis. Still, he wrote, “the experience of mercy enables us to regard all human problems from the standpoint of God’s love, which never tires of welcoming and accompanying,” even in situations marked by failure or sin. In the letter, Pope Francis also asked dioceses that have not yet done so to consider joining the “24 Hours for the Lord” initiative. Near the fourth Sunday of Lent, dioceses choose a church or churches to stay open for 24 hours to offer the sacrament of reconciliation and eucharistic adoration. The pope opens the Rome celebration with a penance service in St. Peter’s Basilica. “It would be a day to help communities and each of the baptized to reflect on how poverty is at the very heart of the Gospel and that, as long as Lazarus lies at the door of our homes, there can be no justice or social peace,” he said. Teaching people “lectio divina,” the prayerful reading of the Bible, especially when focused on texts that speak of God’s mercy and love, will help “give rise to concrete gestures and works of charity,” he wrote. “Their pastoral activity sought to emphasize that God places no roadblocks in the way of those who seek him with a contrite heart, because he goes out to meet everyone like a father,” the pope said.